Are you aware of the fact that the indoor air is more polluted than the outdoor air? Surprised? Yes, it is the truth. To understand this fact, you do not need to do a lot of research. I am telling you why. When we are breathing in, we are taking the components from the air inside. As we breathe out, we are sending them back to the air and it is a continuous process. There are millions of tiny particles and germs are floating in the air that affects our health. To be precise, a study says more than 50 million people in America are suffering from allergy and asthma being contaminated by the indoor airborne pollutants. There are many DIY processes or vacuum cleaners available for removing pollutants. However, none of them can ensure a germ-free indoor air. To keep the indoor air clean and germs free an air purifier becomes a lifesaver. People have witnessed remarkable improvement in their air quality and health condition. An air purifier is a specially designed technology that can pull out dust, dirt, pet hair, dander, smoke, chemical pollutants, smoke, and odor. 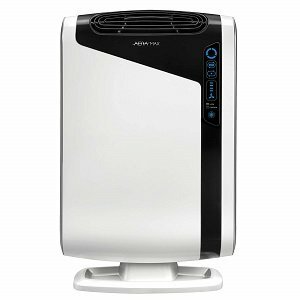 In the market, there is a wide range of air purifiers available, but all of them are not effective. Are you planning to buy an air purifier? Or even you have bought one already. Don't you think you need to how an air purifier actually works? 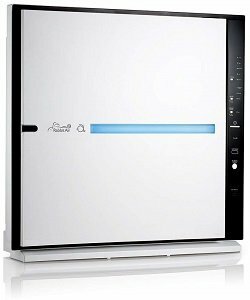 Now, as you know the necessity and benefit of an air purifier, I am going to tell you how this device functions. Keep reading. When you search for the air purifiers, each comes with unique features and facilities. Some come with additional technology. However, the basic system of purifying air is similar among all. The air purifying device contains a fan and layers of filters. The air passes through the device and comes back to the atmosphere after being purified. This process continues 5 to 6 times each hour. If an air purifier comes with HEPA filter, consider that the device will effectively remove impurities from the air. A HEPA filter can remove 99.97% airborne pollutants from the air. This HEPA filter works as a sieve. When the air passes through the filter, it captures all the tiny particles. it can efficiently remove the pollen, mole, smoke, dust, dirt, germs, bacteria, and viruses and pet-induced pollutants that we don't see with our bare eyes. 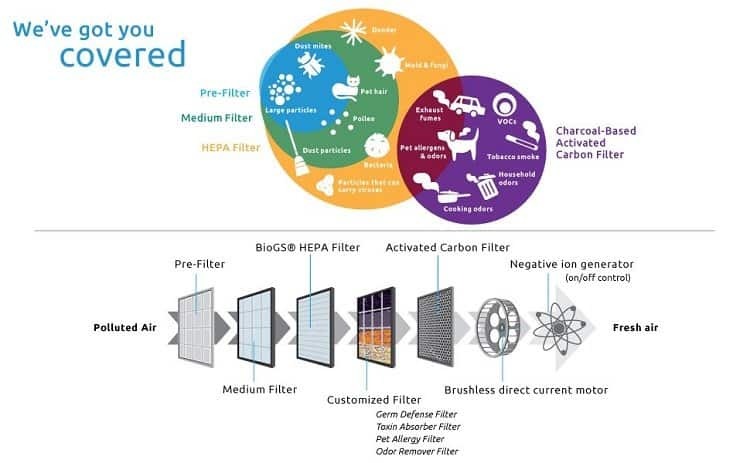 HEPA filter is one of the most significant filters without which a pollutant free atmosphere is impossible. Some devices come with washable HEPA. No matter what, this filter needs to be replaced frequently to get fresh air. A HEPA filter can ensure pollutant-free air, however, it doesn't ensure a breathable air. A fresh breathable air contains soothing smell or no smell at all. Therefore, the carbon filter is essential to remove the unpleasant odor from the air. The carbon filter comes with a small pore. Even though it cannot remove airborne particles, it can pull out smoke, toxic, pet or household induced smell from the air. If you are looking for an air purifier for smoke or unpleasant smell, your device must contain a carbon filter. 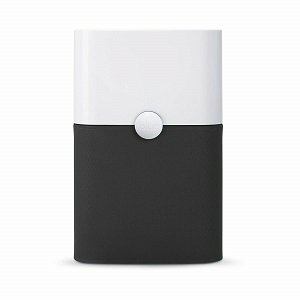 When your device works collaboratively with HEPA and Carbon filter, you will definitely get an odor free and pure air. Usually, an air purifier cannot be found with only a carbon filter. To get a fresh air, the combination of the HEPA and Carbon filter is necessary. Not all of the air purifiers contain an Ionic generator. Usually, an ionic generator doesn't purify the air. Rather, it is a particle collecting technology. A question may arise in your mind, how does the ionic generator work? This technology sends out negative ions in the air. Then, they make the pollutants heavy. As a result, the collection plate pulls out the tiny particles. As you have probably guessed, the UV technology means the Ultra Violet Lighting. We all know the UV radiation that attracts the germs, bacteria, and viruses. The lighting destroys the germs and cleanses them from the air. As they are destroyed, when they are removed from the air, it is no longer harmful to the health. Similar to the carbon filter and Ionic generator, the UV lighting is not installed alone in an air purifier. Instead, it is an additional filter that specifically kills and removes germs, bacteria, and viruses from the air. 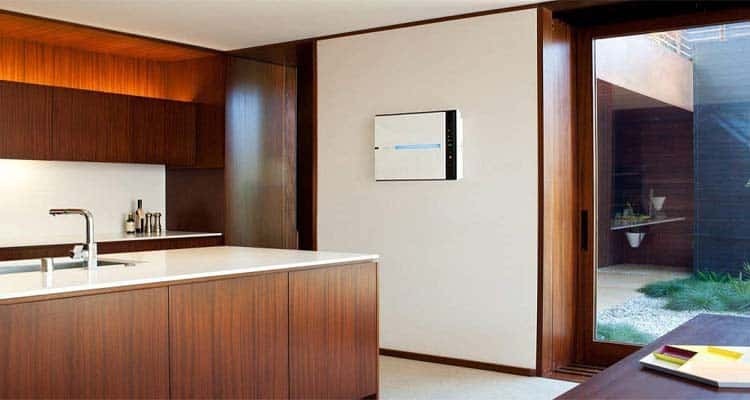 An air purifier with HEPA filter can ensure a pollutant-free environment. However, always consider the coverage capacity of the device. If you buy an air purifier inappropriate with your room size will not give you a satisfactory outcome. 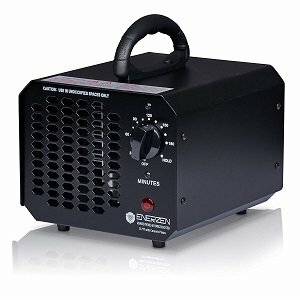 Stay away from buying an air purifier containing only Ion Generator. This technology sends ion into the atmosphere which is harmful to health to some extent. Also, it cannot absorb the tiny particles of airborne pollutants. Whenever you are buying an air purifier, remember the necessity and purpose of buying it. If you are looking for an air purifier to remove particles that induce allergies, pet hair, dander, and odor, your device must contain a strong HEPA filter and UV technology. If you are looking for an air purifier for smoke, your device should come with an activated carbon filter along with HEPA filter. This sums up it is more important to match the purifying system with the user's requirement. We spend most of our time in the indoor atmosphere and dealing with airborne pollutants like dust, dirt, germ, bacteria and many more. The indoor air purifiers ensure a fresh, breathable and germs free environment for you and your family.